Growing carrots takes me back to my first garden as a kid, when I’d go out to the garden, pull a fresh carrot, brush off the dirt, and munch it on the spot, sitting between the rows. There’s nothing quite like the sweet, juicy crunch of a carrot straight out of the ground. Something in the flavor disappears after the carrot has been out of the earth for more than an hour or two. Carrots (Daucus Carrota var. sativus) were domesticated in or around Afghanistan. 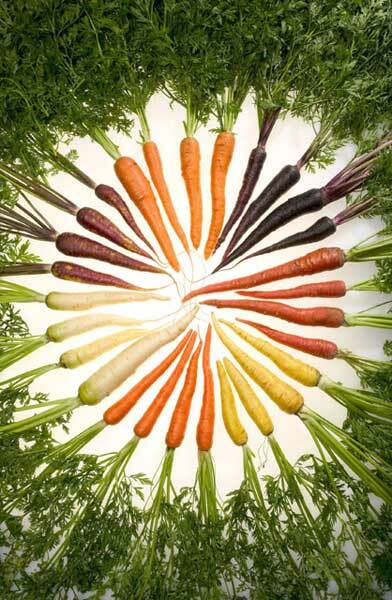 Carrots common to Asia have purple, pink, or red skins, with yellow or orange cores. The deep orange carrots in the west were developed by Dutch breeders in the 17th century. Carrots are biennial plants, grown as annuals. The first year, they store energy in their roots. Then the next spring, they leaf out quickly and send up a flower stalk. Like many other vegetables, carrots can be divided into early, main-crop, and storage varieties. They also come in several Types that vary in size and shape, as well as a range of colors, from the classic deep orange to purple, white, yellow, and red. If you have a rocky or clay loam soil, choose Nantes or Chantenay varieties. These 6-7” (15-18cm) carrots perform well in dense or rocky soils. 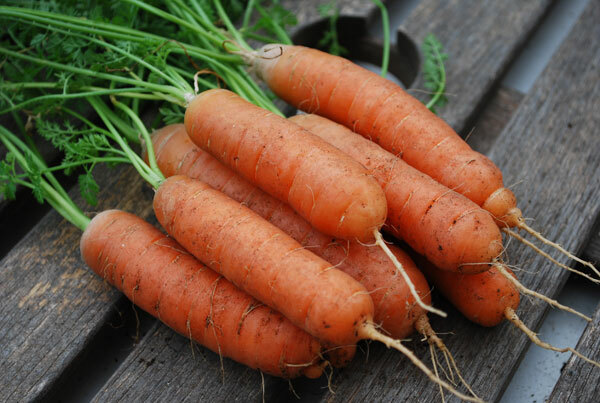 If you’re growing carrots in containers, choose “mini” carrot varieties like ‘Babette’ or round carrots like ‘Romeo’. These varieties also perform well in heavy or rocky soil. 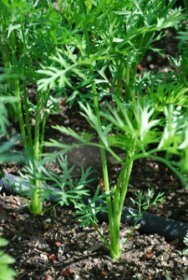 For those of you who have a light or sandy loam soil, congratulations, you have carrot heaven, and can grow any carrot variety you want to try, including the longer Imperator carrots that fork in heavy or rocky soils. Soil tilth, germination, and thinning are the biggest issues when growing carrots. With carrots, the work is all front-loaded in the first 4-6 weeks after sowing. Once the carrots have sprouted and you’ve thinned them to optimal spacing, all you’ve got to do is water and harvest. For a steady supply of carrots, sow small patches every 2-3 weeks. If you start a new patch as soon as the last one is up and growing, you’ll have fresh carrots from your garden most of the year. Carrots are resilient in the face of cold weather. Mature carrots have a lot of sugar, and sugar acts as anti-freeze in plants, interfering with ice crystal formation that disrupts cells. They can withstand freezing temperatures, and cold weather makes them even sweeter. Just get them out of the ground before it freezes solid, or you won’t be able to get to them until next spring. Seedlings and immature carrots are more susceptible to freezing temperatures. They can survive hard frosts, but not sustained freezing temperatures. When growing carrots, you can sow seeds anywhere from 2 weeks before your last frost date in the spring, to 70 days before your first frost date in the fall. 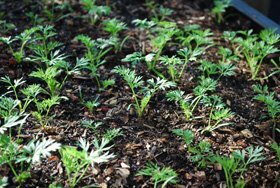 Soil tilth is critical when growing carrots. Carrots need a light, even soil texture to form perfect roots. Soils that drain poorly, have dense clods, or have lots of small rocks result in forked and distorted carrots. 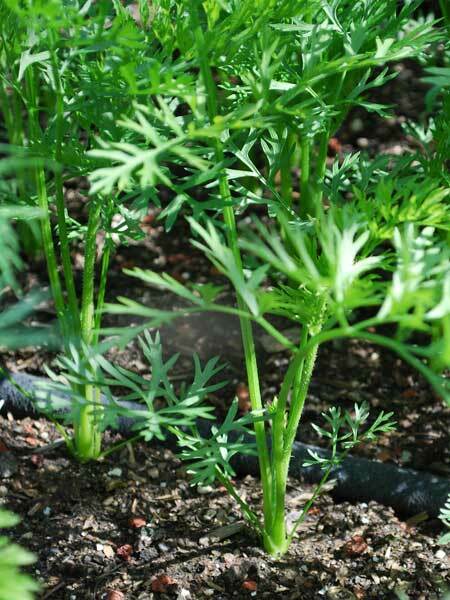 Imperator carrots need 10-12” (25-30cm) of finely-prepared soil. Half-long Nantes varieties need 8” (20cm) of finely-prepared soil to form uniform roots. Sandy loam is the best soil type for growing carrots. It has a fine, even texture, good drainage, and enough organic matter to hold moisture in the soil. If your soil is excessively sandy, incorporate 2-3” (5-8cm) of good garden compost or well-aged manure to improve water retention. If you use fresh manure, work it into the soil in the fall where you plan to plant carrots in the spring. See Gardening in Sandy Soil for more information. Don’t use fresh manure just before planting, unless you want a lot of carrot-tops, and spindly, useless roots. Carrots also grow well in silty soils, as long as there aren’t too many small rocks. But growing carrots in a silty soil can be tricky. Silty soils tend to form hard surface crusts that are difficult for tiny carrot seedlings to penetrate. For more information on soil texture types, see Facts About Soil. To get around this, layer on 2” (5cm) of sifted garden compost or well-aged manure, and mix it into the top 6” (15cm) of soil with a hoe or tiller. Then layer on another ½” (1cm), and lightly rake it into the top 1” (2.5cm) of soil before sowing seeds. Water thoroughly, and don’t allow the soil surface to dry out before carrot seedlings germinate. Growing carrots in clay soil is a real challenge. I can’t count how many stubby, 3” (7cm) carrots with 3 twisted roots at the bottom have come out of my gardens while I was working this out. But I love carrots, so I was persistent. The trick for growing carrots in clay soil is to improve soil porosity and drainage, and break up all the heavy clods. See Improving Clay Soil for more information. Since this is so much work, you’ll have much better success with Nantes, Chantaney, or “Mini” varieties when growing carrots in clay soil. 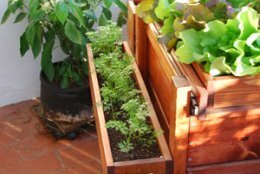 When growing carrots, sow seeds, not plants. Crowded 6-packs of carrot seedlings are a waste of time and money. Tap-rooted vegetables like carrots and beets perform better when sown directly in well-prepared garden soil than they do when grown as seedlings crowded in small pots and transplanted. If you’re planting carrots in a single-dug bed (soil dug or tilled to 1 shovel depth, 8-10”–20-25cm), sow carrot seeds in shallow (1/4”--6mm deep) rows 1 foot (30cm) apart. Carrot seeds are tiny, so a packet of seeds goes a long way. One ounce will sow 100’ (92m) of row. That said, carrot germination can be a tricky process, so until you get the hang of it, it’s better to sow seeds thickly—6-8 seeds/inch—and thin seedlings later. An old gardening trick is to lay sheets of burlap over the row or bed after sowing carrot seeds. The burlap acts like a fine mulch: the fibers hold moisture, speed germin-ation, and protect the soil surface. The seedlings sprout through the mesh. Eventually, the burlap deteriorates, and can be incorporated into the soil at the end of the season as organic matter for the next crop. If you’re planting carrots in a deep-dug or raised garden bed (soil prepared to a depth of 20-24”–50-60cm), broadcast carrot seeds carefully over the bed. Wetting the seeds and coating them with fine, dry sand (“pelletizing”) makes this task easier. Aim for a seed every inch or two over the entire surface of the bed. Whether you’re growing carrots in a single-dug, deep-dug, or raised garden bed, it helps to shake or sift a layer of very fine mulch over the row or bed. The mulch helps hold soil moisture in near the seeds, speeding germination. In silty soils it minimizes the crusting effect of rain, overhead watering, and harsh sun. Cover the seeds with ¼” (6mm) of fine mulch, and water thoroughly. When growing carrots, germination is the hard part. Carrots take 10 days to germinate in warm weather, and up to 3 weeks when it’s cold. The seedbeds have to be kept uniformly moist throughout the germination period. 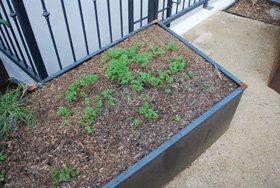 Overhead watering is best when growing carrots, especially while seedlings are germinating. Automated drip systems are useless for seedbeds and young seedlings. Seedlings have short roots, and anything planted between the drip lines won’t get enough water. Use a sprinkler or Soft Spray Wand to keep the soil surface moist. Don’t rely on drip systems until the seedlings are 3-4” (7-10cm) high. When growing carrots, proper plant spacing is essential. It can be tricky sowing carrot seeds evenly over the bed. One way is to oversow, which uses a lot of seeds, then thin the seedlings to the proper spacing once they've come up. Failure to thin produces many tiny, skimpy carrots. A second way, used in deep-dug beds, is to balance the bed when the seedlings have one set of strong true leaves, and the second set is coming in. At this point the seedlings should be 1 1/2 to 2" (3-5cm) tall. If they're any bigger, the roots will be too long and you'll damage them when transplanting, resulting in forked roots. Optimal plant spacing for carrots is 2” (5cm) apart in rows, and 3” (8cm) apart in every direction in a deep-dug or raised garden bed. When the seedlings are 1 to 1 ½” (2.5-3.5cm) high, thin to 1- 1 ½” (2.5-3.5cm) apart, whether you’re growing carrots in rows or broadcast over the bed. If you’re growing carrots in a deep-dug or raised garden bed, this is a good time to balance the bed. “Prick out” crowded seedlings with a fork by pushing the fork 2” (5cm) into the soil on each side of the seedling, then carefully prying it up, while gently tugging the seedling with the other hand. Keep as much soil around the roots as you can. Find a gap in the bed, and make a 3” (7cm) hole with a finger, fork, or dibble. Plant the seedling so the top is just below the soil line, then press the soil in around the root. Set transplanted seedlings 3” (7cm) apart from established seedlings, and fill in any gaps in the bed. 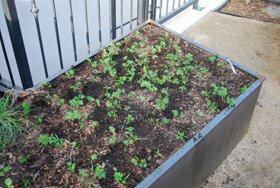 When you’re done moving seedlings, backfill any holes left in the bed with extra soil and give the bed a good soaking. Keep it moist for several days until the transplanted seedlings are established. Yes, I know I said transplanting carrots wasn’t a good idea, but you can get away with it, as long as the seedlings aren’t more than 1- 1 ½” (2.5-3.5cm) tall. Don’t waste your time trying it with larger seedlings, or with overcrowded seedlings with intertwined roots (this is always the case with carrot seeds started in 6-packs). When the carrot tops are 3-4” (7-10cm) high, do a final round of thinning. You can harvest tender baby carrots when thinning them to the final 3” (7cm) spacing. If you see carrots with exposed shoulders, move soil or mulch up against them to cover the crowns and prevent greening—where the top of the carrot turns green from sun exposure. Other than this, watering and harvesting are the only work that’s needed. Overhead watering works better than drip irrigation for carrots. With drip systems, carrots between the lines are sometimes short and stubby, while carrots along the lines are normal. Carrots are light feeders, and need no fertilizer in most vegetable garden soil. Don’t plant them in the same bed with heavy feeders. Excessive nitrogen results in huge carrot tops and thick-skinned, forked carrots. As discussed above, once your carrots are thinned, watering and harvesting are all that’s needed. Carrot Rust Fly is the main carrot pest for home gardeners. If you rotate crops, it helps keep populations from building up to problem levels. Allow 3 years before you plant carrots in the same bed. Floating row covers can be used in severe infestations. 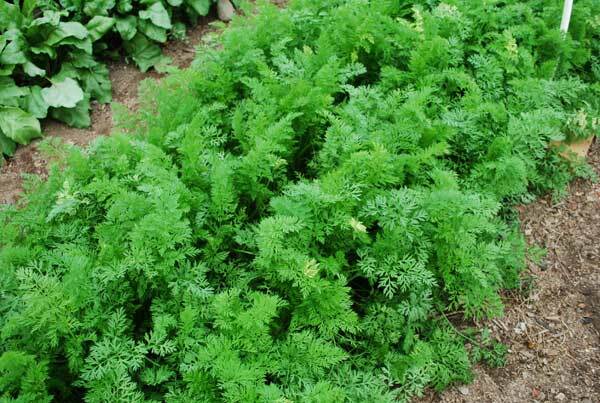 See Carrot Companion Plants for plants that help deter rust flies. Wireworms are beetle larvae that burrow into the roots. They can be discouraged with a dusting of wood ashes around the plants. Predatory flies can help keep adult carrot rust flies in check, and ground beetles prey on the larvae when they crawl into the soil to pupate. 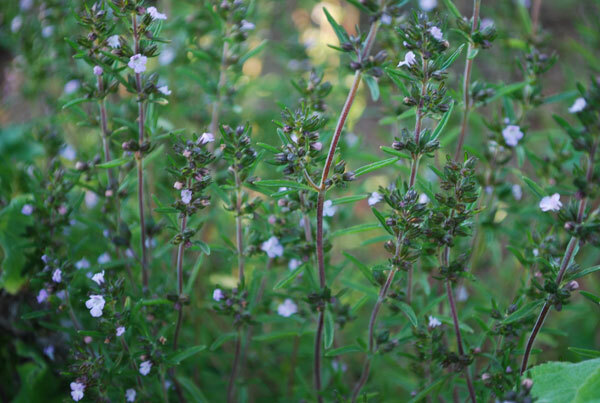 See Attracting Beneficial Insects for ways to encourage these garden allies. Alternaria and Cercospora Blights can damage the foliage of carrots, reducing the size of the roots. Resistant varieties have strong tops that can weather blight damage but still produce a crop. For more information, see Cornell’s Vegetable MD Online for a series of articles on carrot diseases, complete with photos. Click Here for Cornell’s list of disease-resistant carrots. Forking can be caused by rocky or lumpy soil, poor drainage, insufficient water, or high nitrogen levels in the soil. "Greening" occurs when soil washes away around the tops of the roots, and the shoulders of the carrots turn green. If you see the tops of the carrots exposed, push some soil or mulch over the tops to prevent greening. Splitting is caused by alternating dry and wet periods. For cool-season vegetables like carrots, maintain even soil moisture by mulching and steady, regular watering. If you’re growing carrots where carrot rust flies are prevalent, plant aromatic herbs like basil or summer savory around the edges of the carrot patch. Their volatile oils can help mask carrot odors that attract rust flies. Carrots are good companion plants for alliums like onions, shallots, and chives. Growing carrots around peas, lettuce, and tomatoes can enhance the growth and flavor of all associated plants—but avoid planting carrots in tomato beds that have high nitrogen levels.